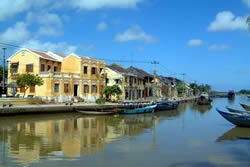 Ventures in Pixels Blog - Marketing, Internet and Vietnam: Vietnam Inside! It's all happening in Vietnam right now. Intel announced a $1bn investment to create two manufacturing centres outside Ho Chi Minh City employing 4,000 people. Last month the country was admitted to the WTO and next week APEC kicks off in Hoi An, with non other than George W Bush in attendance. "Edible sea swallows' nests... processing the nests is quite simple: one must pick off all the bird feathers, faeces, or dry leaves stuck in the nest with a sharp knife."